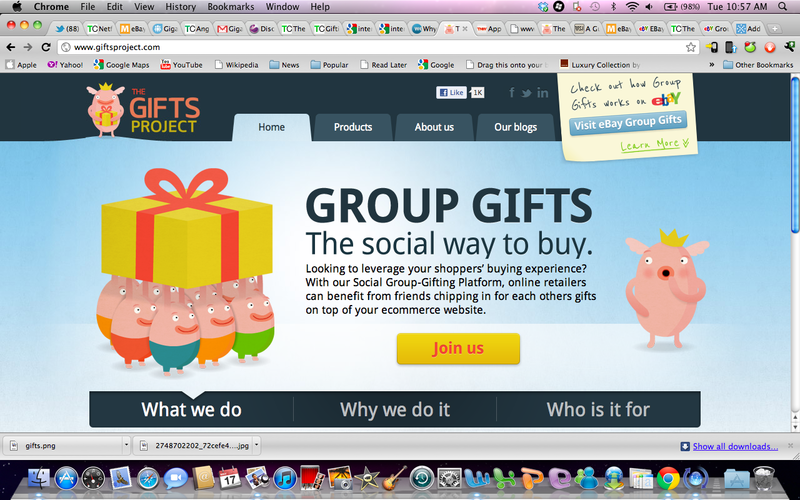 Is Group Gift Buying Poised for Take-Off? Physical retailers and merchants have been able to tap the power of collective buying through start-ups like Groupon and Living Social for some time. Now, online retailers are moving to start leveraging the power of social commerce as well, with the help of group gift-buying startups that are integrating gift widgets into their sites. Companies like the Gifts Project and Friendfund are working to integrate into retail sites either through widgets or white label services, giving businesses an easy way to enable group gifting. EBay in November launched its Group Gifts service in November, which is powered by the Gifts Project. It was the first company to offer the white label service, but now that its exclusivity period recently ended, other online merchants are likely to follow. The Gifts Project CEO and co-founder Ron Gura said that Crate and Barrel and CafePress will be adding plug-ins from the startup on their sites in the coming weeks, and more partners are expected to be announced next month at the Internet Retailer Conference & Exhibition in San Diego next month. Gura said the pieces have finally fallen into place for group gift buying to become a viable tool for retailers. This is part of a larger trend in group payments, a market segment that is also heating up. Giftiki, a collaborative gift-giving start-up, last month raised $1 million from Tim Draper and others, while the Gifts Project pulled in $1 million from Gemini Israel Funds and Index Ventures late last year. Friendfund also raised an undisclosed amount of money earlier this month from a group of Angel investors, while WePay grabbed $7.5 million last summer. What’s interesting to me here is not the group payments in general but how retailers are now waking up to the opportunity and are moving toward integrating the group-buying option right into their sites. It makes a whole lot of sense for any retailer, gift registry, even travel sites that want to offer trips as a gift. We make products more affordable by allowing a group payment method and in the course of creating a pool, an invitation is sent out in social networks and anything that happens, it’s mentioned in a Twitter or Facebook stream so merchants can get a huge visibility boom. Not all activity will be broadcast, especially in the case of surprise gifts. But merchants are able to really tap into social networks organically and leverage them effectively with these group buying options. While Facebook’s “Like” button has colonized much of the web, I think merchants will have even more incentive to lean on group buying options, especially with larger ticket items, as a way of stimulating demand.